The concert is fully booked! 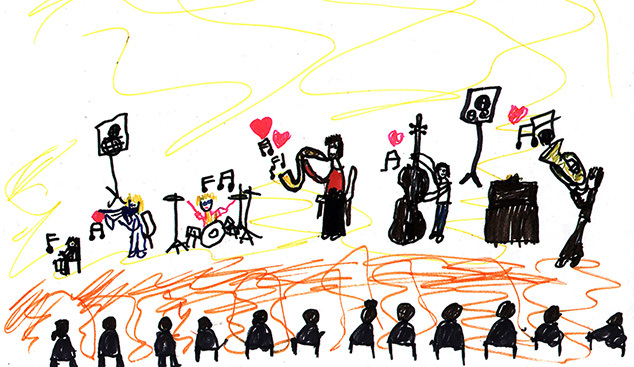 This concert is only for school kids, classes 3.–6. Duration 40 minutes. Peter and the Wolf (ven. Петя и волк eli Petja i volk) is a beloved musical fairy tale from the 1930’s. It tells a story of a young boy and his animal friends threatened by a vicious wolf lurking around. The work is very popular both among the children and the grown-ups internationally. Sergei Prokofiev wrote the story and composed the music in 1936. The composition is performed by a narrator and an orchestra. Each of the seven characters of the story is portrayed by its own instrument and musical theme. In 1966, the celebrated bandleader Oliver Nelson arranged the piece for his big band. His arrangement of Peter and the Wolf was premièred in Finland in last year by UMO Jazz Orchestra and now there’s more to come. The story is visualised by illustrations made by Spanish artist Ayesha López. This concert is only for school kids, classes 3.–6. The concert is free but it requires a registration at www.vuotalo.fi. NOTE! The concert is sold out.